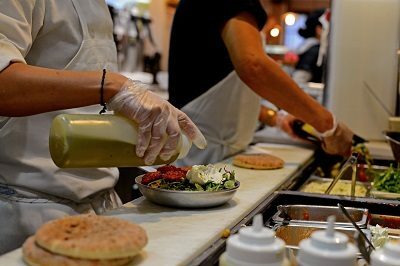 Taboonette is a fast casual, Middleterranean™ restaurant that is revolutionizing the falafel shop. Inspired by a trip which co-owner, Danny Hodak, took to Israel, the elevated shop brings the healthy diets of the Middle East and Mediterranean and fuses them with chef-driven food and American style. With recipes curated by classically trained, renowned Israeli chef, Efi Naon, the eatery takes a modern approach to food created in the age-old, wood-fired taboon ovens for which Taboonette is named. Opening eyes to gourmet Mediterranean food, the shop offers locally sourced and sustainable meals in a rustic chic atmosphere that fosters social consciousness and brings people together. Now a standout amongst New York’s popular upscale fast casual restaurants, Taboonette will build on its seasoned approach to success as it begins nationwide franchise expansion. Taboonette currently has one corporately-owned location in New York, with a track record for success which will lead the brand to impressive growth. The popular Union Square hot spot will open its second corporate location in Q1 of 2019 with two additional restaurants slated to open by year-end.